There is no lower rank than cabin boy on the warship Invincible. But Dantar knows he is important, because anyone who threatens his life gets turned into a pile of ashes. His older sister Velza is a shapecasting warrior, in a world where only men fight. Until now. Together they must solve the mystery of broken magic and escape the dragon. 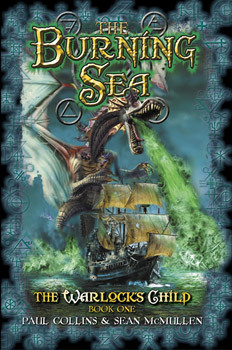 Paul Collins is the author of 140 books, including fantasy series The Jelindel Chronicles, The Quentaris Chronicles and The World of Grrym (in collaboration with Danny Willis). Sean McMullen is the author of over a hundred fantasy and science fiction novels and stories including Souls in the Great Machine and Voyage of the Shadowmoon. He was runner up for the Hugo Award in 2011.